From time to time we like to digress from writing about perimeter security issues and, instead, share a little 'in house' story. To date we have covered some diverse and interesting events - such as how overseas visitors enjoy our fascinating, local history in between discussions at our Head Office or how our Technical Director Andy Moon got to take some amazing photographs on the perimeter of the Petronas Towers in Kuala Lumpur. 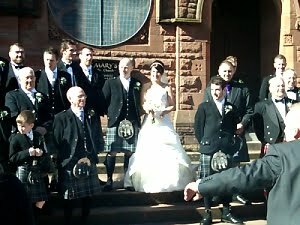 Our story today, however, has a little more 'romance' .... it's about a rather special Scottish wedding! Louise Ewings has worked in our Accounts Administration Department for over 5 years. A popular and valued member of staff, Louise kindly invited us to attend her marriage to Neil McInnes. It was a day we shall all remember and Louise and Neil have kindly agreed to let us share some of the highlights with you. The marriage took place in St Mary's RC Church, Stirling which is on the main thoroughfare that leads upwards to Stirling Castle and downwards onto the Stirling Bridge. The Battle of Stirling Bridge was the primary victory of Scottish hero William Wallace over the English more than 700 years ago. 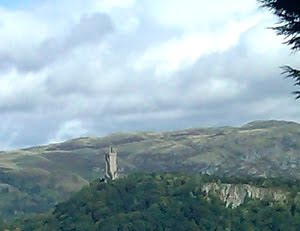 The photograph shows the view up to the Wallace Monument from outside the church. The happy couple looked perfect as they stood outside the church for photographs. Louise was radiant in her beautiful white wedding dress and Neil looked a true Scot wearing his Scottish tartan kilt and sporran. Scottish history enthusiasts might like to know that the tartan was Balmoral grey! 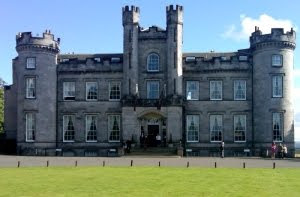 The wedding reception was held at the award-winning Airth Castle Hotel, renowned as one of the best wedding venues in Scotland. We take this opportunity to thank you, Louise & Neil, for allowing us to share in your special day.